I have been contacted by several riders who have been unable to find an instructor willing to teach them in a bitless bridle. One rider, who wanted to improve her jumping , was told her horse would not perform well without a bit. I would love to ask these instructors one question …...WHY ? Riding should not be about bullying the horse into submission by inflicting pain, but should be about subtle , effective communication , using your aids in a way that gives a clear message to the horse , without the use of excessive force. If the horse does not respond as expected, then ask yourself what YOU have done wrong, try again, making your message clearer, this does not necessarily mean a stronger aid. Often having an experienced knowledgable person watching from the ground can be most helpful. If one reviews the latest research with regard to the bit, it becomes quite clear that the bit causes many problems , and using the bit is counter-productive to the horses willingness to go forward willingly . As for being unable to ‘work through’ (on the bit – to the aids ) , this has nothing to do with using a bit, in fact once again , the bit can be a hinderance to this, read below to understand why. 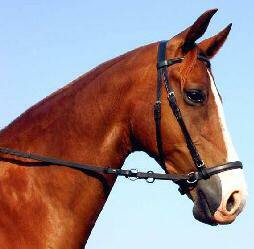 Read my blog ‘How do you ride ‘on the bit’ in a bitless bridle’ . Man has underestimated the harmful effect of placing one or more metal rods in a horse’s mouth (Cook 1998a, 1998b, 1999a, 1999b, 1999c, 2000, 2001a, 2001b, 2002a, 2002b, 2002c, and 2003) [The texts of the full references are available at www.bitlessbridle.com. A complete reference list of all the articles that have been published about the new bridle is also available online]. Though all horsemen are familiar with the phrase ‘aversion to the bit’, if they were asked to compile a list of the problems that make up this syndrome they would probably have difficulty in thinking of more than half a dozen. 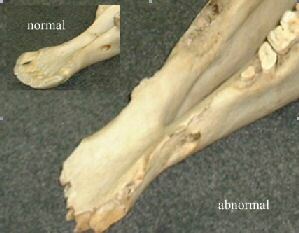 Fig 4 – This is what a horse looks like if one apportions scale and color to represent the relative sensitivity to touch of its various parts. The red areas represent those areas that are most generously supplied with sensory nerves. 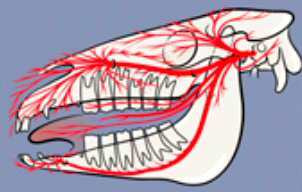 In such a representation the muzzle and mouth become the largest parts because these are the most ‘touchy/feely’ areas. 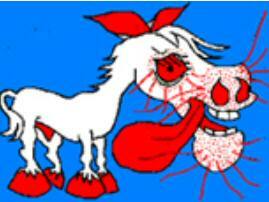 The horse depends on its muzzle to feel its way around the world. 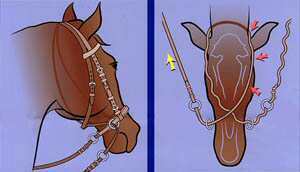 A double bridle is made up of a small snaffle known as a bradoon, which communicates with the mouth as above and a curb bit, which has a leverage action and also applies pressure on the chin and poll. The port of the curb is designed to relieve pressure on the tongue and to actually encourage bar pressure. For the purposes of description it could be referred to as the jawbone vise (vice) method, as – except in the hands of a master – it squeezes the jawbone between two pieces of steel, the mouthpiece of the curb and the curb chain. Because the curb bit is placed lower in the horse’s mouth than the snaffle, the pressure is applied to the bars at the level of the body of the mandible rather than its branches (see Part I, Fig 2). A snaffle bit is more likely to apply pressure to the bars of the mouth over the branches of the mandible, especially if it is placed ‘high’ in the mouth. The questionnaire is available as a pdf download here – you will need Acrobat Reader to view & print it – if that program is not already installed on your computer it is available as a free download by clicking the following link ]. Also available as a printed document (free of charge) in our online shop. From prehistoric times until quite recent years, the bit has been thought of as a method of control. But the bit has never worked like a steering wheel or a brake on a car. Use of the word ‘control’ has led to a serious misunderstanding in the history of equitation. A bit is not and never has been a mechanical device for controlling a horse at exercise. At best it is a signaling device for communication. It should not and cannot be used to ‘control’ in the sense of ‘command.’ It should and can only be used to signal a request. The more polite (ie painless) the request, the more likely it is that the horse will comply. Unfortunately, because all bits are foreign bodies inserted into a highly sensitive body cavity and used to apply highly focused pressure on bone, they are – by their very nature – painful. The only way that a bit can never cause pain is for it never to be used. Cook, W.R. (1999c): The ear, the nose, and the lie in the throat. In “Guardians of the Horse: Past, Present and Future.” Ed: Rossdale,P.D., Greet, T.R.C., Harris, P.A., Green, R.E., and Hall, S.. British Equine Veterinary Association and Romney Publications, pp 175-182.